One passenger posted a video on Facebook showing hallways being sprayed by crew members in industrial cleaning suits. “I’m on here now and basically a sitting duck with people in both cabins either side not well with the gastro,” another person commented on the video. “They are doing everything perfectly to avoid further sickness. Another reported that restaurants could not be accessed, finger food had been stopped and a galley tour had been cancelled. Other passengers praised the crew’s efforts to deal with the outbreak. “The ship is doing absolutely everything to control it, you wash your hands at least a dozen times a day. Their hygiene is first class, it’s obviously a passenger that’s brought it on,” one passenger told the ABC. The ship is due to leave Hobart later today and arrive in Sydney on Thursday. New passengers due to board the ship in Sydney for a new cruise will be delayed to allow for further cleaning. “Upon arrival into port in Sydney, the ship and terminal will be comprehensively sanitised and cleansed to help prevent the spread of illness, resulting in a delay to boarding for new guests,” the company’s statement said. 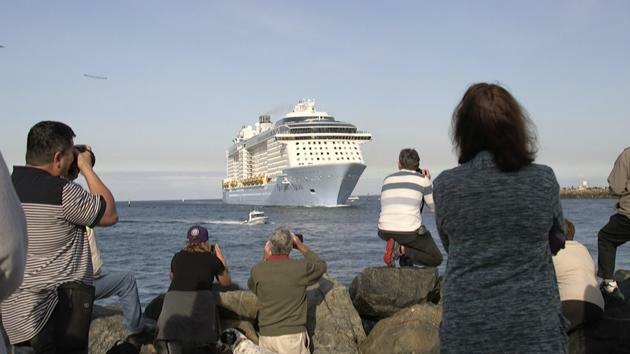 The Tasmanian Health Service said the cruise ship had notified local authorities about the outbreak and public health services were working with the ship. “It is not unusual for gastroenteritis outbreaks to occur aboard cruise ships, just as it is within the normal population,” a spokesman said. Three ambulances greeted the ship when it docked in Hobart. “The ship has notified health services of two passengers that are likely to require transfer to a hospital for medical assistance,” he said. This afternoon authorities confirmed five passengers had presented to the Royal Hobart Hospital needing treatment. Last week a male crew member had been medically evacuated near Albany. A statement from the company said he had fallen ill with “symptoms of kidney distress”.